If you're playing Gears of War 3 online, then you could appear in the commercials. Sort of. 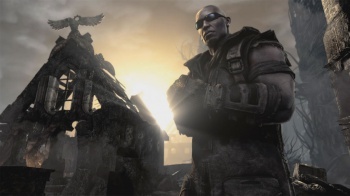 TV ads for Gears of War 3 in the UK will soon display the number of people playing the game online. Microsoft says that this will be the first time that the gaming industry has featured live TV advertising. Microsoft's Stephen McGill says that the publisher is spending a lot of money on advertising Gear of War 3, with a campaign that rivals those for Halo 3 and Halo: Reach in scale. He also said that the game was coming out at a time when there wasn't a whole lot to competition about, and that the real challenge for the series would come in November, when Modern Warfare 3 and Battlefield 3 were duking it out. The campaign starts on September 23rd and will run in six batches until October 3rd. That might seem like an awfully short amount of time, but that's to the game's advantage, as the player population is unlikely to drop significantly before the campaign is done.